Three of my favourite suppliers from Rhinebeck! Good morning from a very snowy Clasheen! Although we had a bit of a thaw yesterday morning there was another fall of snow last night bringing our total depth in this neck of the woods up to 12″ in most areas, deeper in selected spots. The good news is that I am confined to barracks and suffering NO guilty feelings about felting non stop but the bad news is that I have very limited supplies of short fibred merino (new order on the way from Wollknoll) so have put the next phase of my ArtL!nks project on hold until my delivery arrives sometime after my house becomes accessible again! I have also been having internet and phone connection problems so please bear with me but am sure that this is weather related, amazingly we had crashing thunder and incredible lightning at 6.40am yesterday and another bout during the day, very odd to have snow and lightning at the same time. As promised I want to tell you about my favourite suppliers from Rhinebeck so here goes with three of my top picks, Cloverleaf Farms, Homestead Heirlooms and Maggie’s Farm. These are my personal selections and don’t mean to say that other vendors didn’t have fantastic supplies too, I loved the whole shebang and was trying to pick up goodies that might have been difficult to find here in Ireland and remember I was looking for materials as a felter and not a knitter/spinner. Cloverleaf Farms is run by Joan Berner and boy does she have beautiful hand dyed fibres for felting or spinning, must be because she is an excellent felter herself! I made two purchasing trips to Joan’s stand, one on Saturday and the second on Sunday because for me her lustrous colours were unequalled at the show, the fibres didn’t appear to be over heated during the dying process and I loved the fact that they could be bought in Blue Faced Leiscester (which I had heard of but never seen before), Merino, Silk and various combinations thereof. My second pick is Homestead Heirlooms where I bought as many pairs of simple pre-punched leather handles as I was able to afford in lovely colours including the yummiest green possible! I had seen their work on the internet before but was a little nervous buying on speck, now I can’t wait to re-order but obviously I need to make a few more bags and use up this stock first. My third pick is Maggie’s Farm and here I bought the most divine smelling chunk of homemade soap ever! It was a huge chunk and kind of looked like a big piece of cheddar, the smell is subtly clove like however and it is just the best thing for felting. Unfortunately the chunks were really heavy otherwise I would have bought the entire stock and stored it in my hotpress to scent my clothes, buy some if you can!!! Lastly I want to share with you my gorgeous new cowl from Rachel aka Pushkin on Ravelry, it couldn’t have arrived at a better time with all the snow! 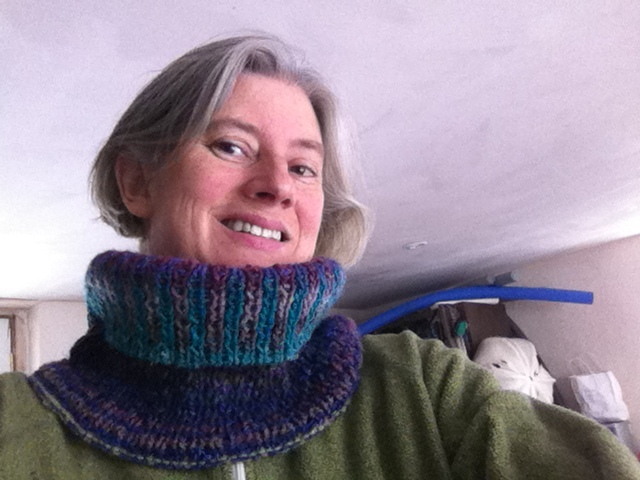 My wonderful new cowl from Rachel- please excuse the bug eyed photo but it is difficult to take pictures of oneself! This entry was posted in America 2010, Felt and tagged Cloverleaf Farms, cowl, Felt, Felting, Homestead Heirlooks, Maggie's Farm, Rhinebeck by Nicola. Bookmark the permalink. Thanks for the suppliers-tip of short fibred merino! I’ve just placed an order at the Wollknoll! Well, thanks so much for sending some of that snow our way…Just received our first accumulation yesterday and it’s still coming down. It’s awfully pretty, but the roads are very treacherous and all are re-learning how to drive in it…A bit scary! I’m glad that your weather has allowed you some “play time”…You surely needed it. That’s one of the things that I love about winter…It does cause us to slow down a bit. I, for one, can vouch for the beauty of the Cloverleaf Farms gorgeous fibers, as I received the most delightful surprise package with an assortment of their goodies:-)…The Sapphire color-way is one of the most beautiful combinations I’ve ever seen…I love it!!! And you’re so right…Joan certainly knows what she’s doing…The fibers are marvelous! Let me know if you need me to call out a State of Emergency due to your dwindling supply of short fiber merino. Hope your package is able to be delivered in short order.